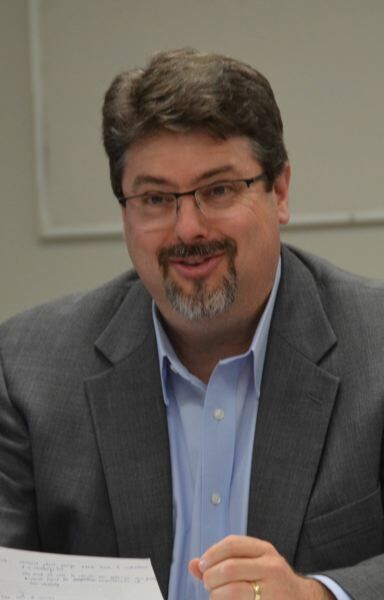 UPDATED: The pool of candidates being considered for the permanent superintendent role with the Scappoose School District was trimmed this week when Interim Superintendent Paul Peterson withdrew his application. Peterson announced the decision publicly Tuesday, March 26, by publishing a statement on the district's social media and email platforms. 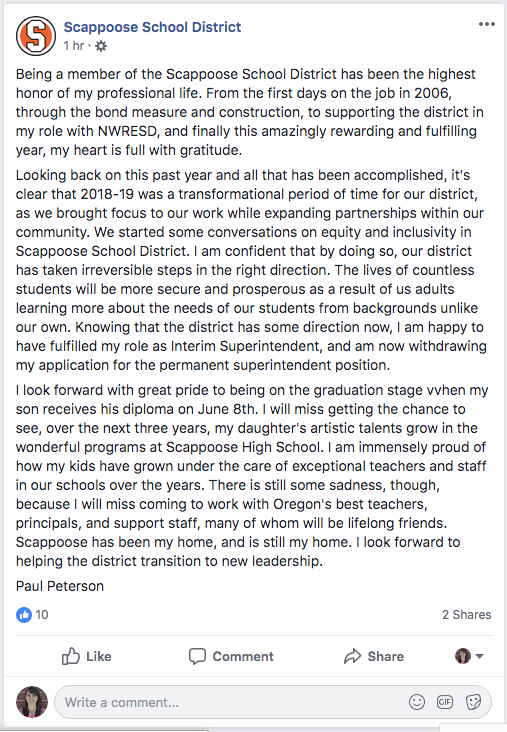 In the statement, Peterson reflected on the district's growth over the past year, as well as his personal growth by working with Scappoose schools. "Knowing that the district has some direction now, I am happy to have fulfilled my role as Interim Superintendent, and am now withdrawing my application for the permanent superintendent position," Peterson stated, in part, in the announcement. A full copy of his statement can be found here. Peterson was one of four finalists being considered by the Scappoose School District board of directors for the full-time superintendent job. The school board met in executive session Monday night, March 25, to discuss the superintendent hiring process several days after meet-and-greets with four finalists for the position, including Peterson. The board met for about an hour in closed session and made no decisions following the meeting. Board Chair Phil Lager refused to answer questions about whether or not the board had been made aware of Peterson's decision prior to the Tuesday announcement, saying he could not comment on talks held in executive session. "It's not about being transparent. It's about protecting the legitimacy of executive session," Lager said when asked about Peterson's withdrawal from consideration. Lager said Tuesday morning that the board was in the middle of the hiring process, and that all candidates were still being considered. Lager said the goal was to announce a final pick by the next board meeting on April 8. "If Paul chose to announce his withdrawal, that is Paul's choice. That is his choice and not my choice and no other candidates can be spoken about outside of executive session," Lager said. Peterson's one-year interim contract with the district expires at the end of June. 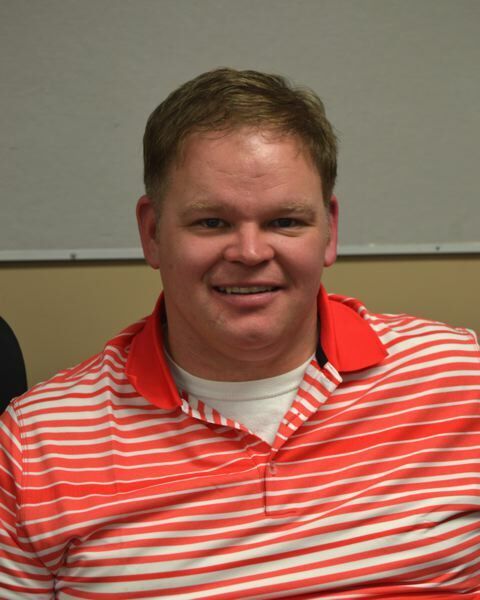 He was hired last May by a 5 to 2 vote of the school board for an interim role, after the school board was unsuccessful in its effort to hire a permanent superintendent. The last permanent superintendent to lead the district was Stephen Jupe, who left in June 2017 with a year remaining on his contract. The district then appointed Ron Alley, who was then the director of curriculum, instruction and secondary education, to an interim superintendent role. Last March and April, Alley was one of two finalists for the permanent role when he withdrew his application and the other candidate accepted an out-of-state offer. The district then embarked on a new search this winter. Peterson had previously served as the permanent superintendent from 2006 to 2011 before he was let go early from his contract. During his tenure, the school district successfully passed a $33 million bond measure. In 2012, the school district settled a discrimination lawsuit that had been filed against Peterson by three female school administrators for $500,000. Peterson served as an assistant superintendent for the Northwest Regional Education Service District for six years before returning to Scappoose. He was not immediately available for comment on this story.